Coming off an 85-80 setback to Pure Playaz, Cedrick King dominated the boards with 22 rebounds and was among four players hitting double figures as the Knights handed the Hon. 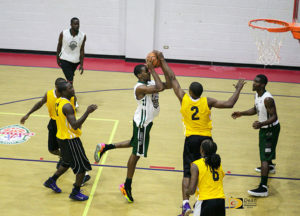 Julian Fraser Save The Seed Basketball League defending champions Splash Brothers a 74-66 setback—their second successive loss to start the 2018 league. King also had 12 points. Jevon Serrant had a team high 15 points to go with six rebounds, six assists and four steals. Nicols Charles added 13 and Lyle Duggins 11. Ashield Frett had a game high 20 points and pulled 14 off the rack for his double double. Jasin Rhymer Jr. chipped in 14, while Deangelo Sampson narrowly missed the coveted double with 12 points and nine rebounds. Steve Parillon grabbed 15 rebounds and dropped in five points. Tavon Phillips had a game high 30 points and 10 rebounds while Mikey Joseph added 22 points and a game highs 16 rebounds, during Bay Side Blazers’ 109-60 triumph over DA 3rd. They were following up a 109-49 whipping of Young Empire. Nixon Hamilton dripped in 16 points and 11 rebounds to the tally. Stephon Caul finished with 13 and Travis Issac 11. Anthony Keane pulled down 14 rebounds and tossed in eight points. Vincent Wattley led DA 3rd with 15 points and nine rebounds. Jiminez Stoutt poured in another 14, while Rushaun Johnson grabbed 11 rebounds to go with is eight points. Momentum bounced back from Friday night’s 68-55 setback to Warrias, by trimming We Dem Boys, 72-69, on Saturday. 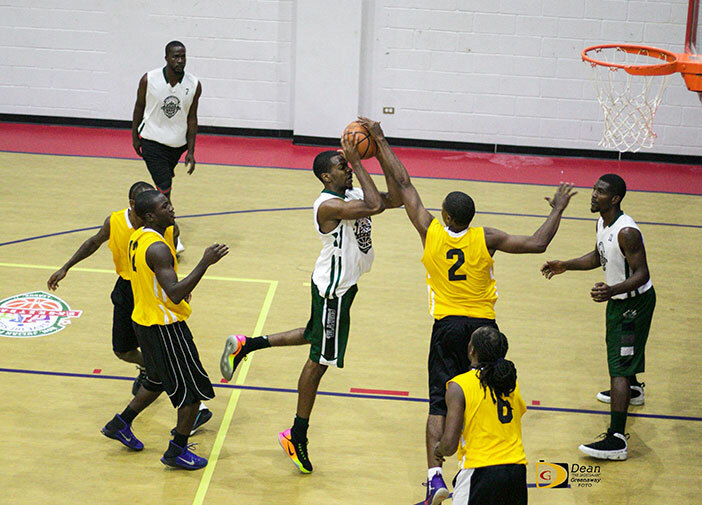 Requan Fahie and Mackebo Fahie had 18 points respectively for Momentum, with Requan snatching 16 rebounds for his double double. Hakeem Penn followed up with 17 points and nine rebounds to go with five steals and four assists. Ray Victor narrowly missed a triple double in leading We Dem Boys with a game high 19 points, 11 rebounds and eight assists. Romain Minot dropped in another 18 on the score sheet. In the Jr. Division, Jr. Bayside Blazers stopped the East Cavaliers, 46-19. Donaldson Layne was Jr. Bayside Blazers top scorer with nine points and four rebounds while Jiliani Leonard chipped in eight points and eight rebounds. Lemar Jackson, Vance John and Gershon Bowers, each had five points as East Cavaliers leading scorers. Elroy Bollers finished with 13 points as Young Stars handed East Cavaliers a second loss, 33-24. Raheem Hodge poured in another nine points. Bowers and Kimoy Lane scored six points each for East Cavaliers.